Who is eligible to vote: All registered voters. This is an open partisan primary election for the Democratic, Green and Republican Parties. Unaffiliated (Independent, no party designated or Other) registered voters are cordially invited to help pick the next Democratic nominees. DO NOT TOUCH ANYONE ELSE’S BALLOT. Exception: If you’re family or a caretaker or a household member (i.e. you live at the same residence as the voter does). Hours the polling places will be open – 6:00 am to 7:00 pm. All polling places located on the Navajo Nation are on Daylight Savings Time so they open at 5:00 am (Arizona time) and close 6:00 pm (Arizona time). 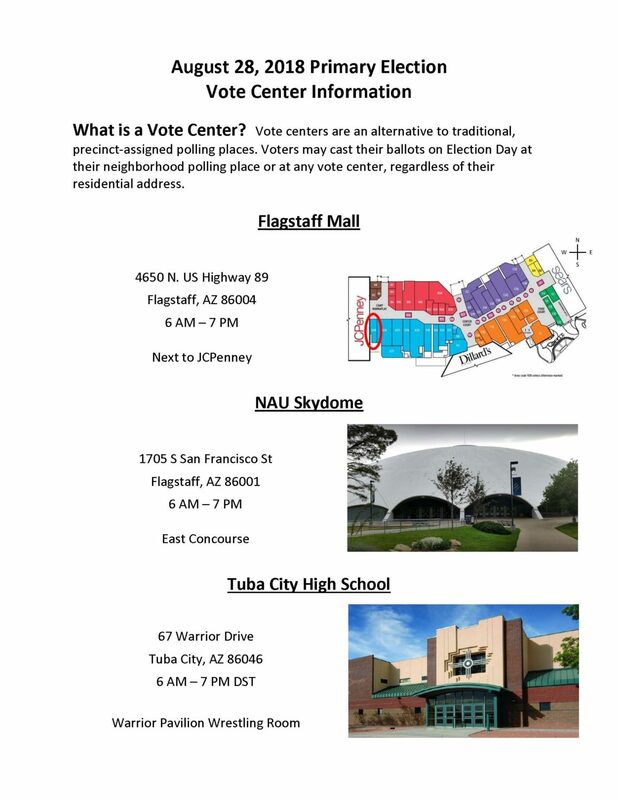 Three Vote Centers – This is the first election in Coconino County where we will be using Vote Centers. Vote Centers are an alternative to traditional, precinct-assigned polling places. Voters may cast their ballots on Election Day at their neighborhood polling place or at any vote center, regardless of their residential address. Posted in Action Alerts, Latest News and tagged Coconino County Voting Information, primary election, Vote Centers.